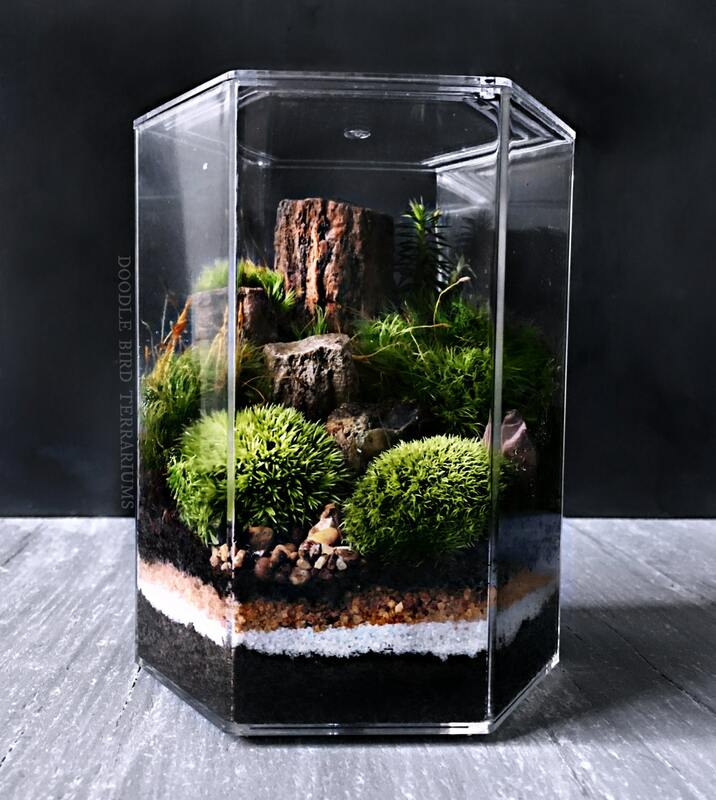 A lush garden landscape scene is planted using live mosses inside a geometric hexagon shaped jar. 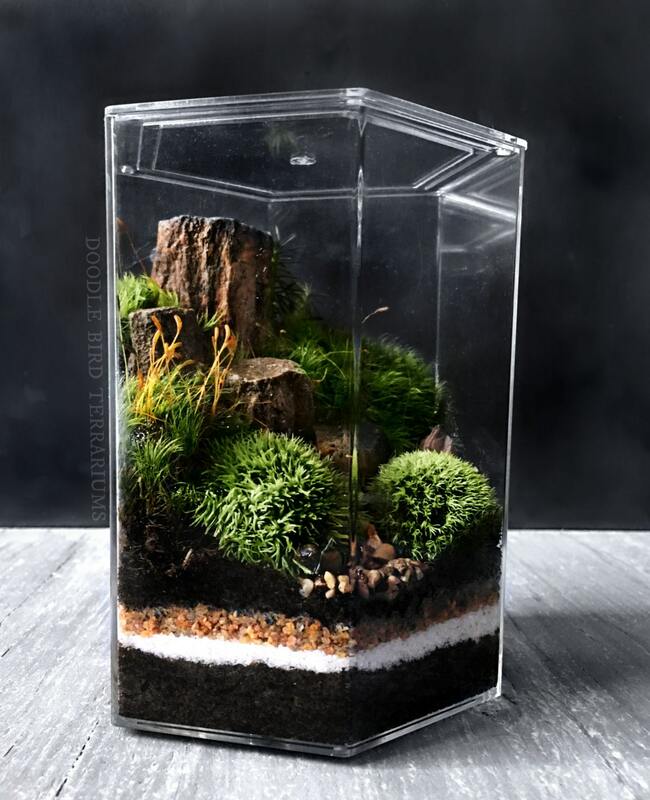 Virtually unbreakable, the crystal clear acrylic container houses layers of sand and soil, rock, and a variety of live mosses. Each piece is artfully planted by hand and will be unique from the next. Terrarium orders are generally processed and shipped in the order they are received. Each piece is packaged using soft material that holds everything in place so that nothing is disturbed or moved around in transit. Each terrarium is made to order and the processing time is around 14 days. Actual transit time (once shipped) is from 2-3 days in most cases. Please take a moment to browse my policies page for additional ordering information. •INTERNATIONAL: Live plants cannot be shipped outside the United States due to strict customs laws. Any package is subject to inspection and illegal goods (such as live plants) are confiscated and disposed of. For that reason we are unable to ship internationally. ● Custom Orders: All payments are due in full before items will be shipped. Deposits are non-refundable. ● Sales tax is automatically added to Minnesota addresses. ● All terrariums are shipped using USPS 2-3 day Priority Mail unless otherwise noted. Tracking is provided on all U.S. orders. Note: USPS does not guarantee the package will arrive within 2-3 days when shipped via Priority Mail. Therefore in some rare cases it may take up to 5 days to arrive. Rest assured your plants can survive this. ● PLEASE ALLOW AT LEAST 14 DAYS FOR DELIVERY. Orders are almost always processed in the order they are received. Processing orders usually takes about 12-14 days followed by the actual time it takes to arrive at your home once shipped. 1. Take photo of damaged packaging (smashed box, dents, etc). 2. Take photo of interior damage (item still in package broken) if possible. 3. Take photo of item damage (do not unpack if glass is shattered to avoid injury, just try to get the best photo possible). 4. Send me a message with photos and description. 5. You will be contacted within 24 hours explaining the next steps of the claim process. *Please note that refunds are made via the insurance claim and may take a few weeks to receive. ● Lost Package? On extremely rare occasions packages are shown as delivered via delivery confirmation/tracking but a customer reports it stolen or missing. In such a case please contact me as soon as possible to start the insurance claim process through USPS. ● Terrariums are perishable and fragile items and for that reason CANNOT be returned or exchanged. ● CANCELLATION POLICY: You may cancel an order for up to 24 hours following the purchase for a full refund (unless it has shipped). Custom orders cannot be cancelled with the exception of extreme circumstances and will be determined by the shop owner. 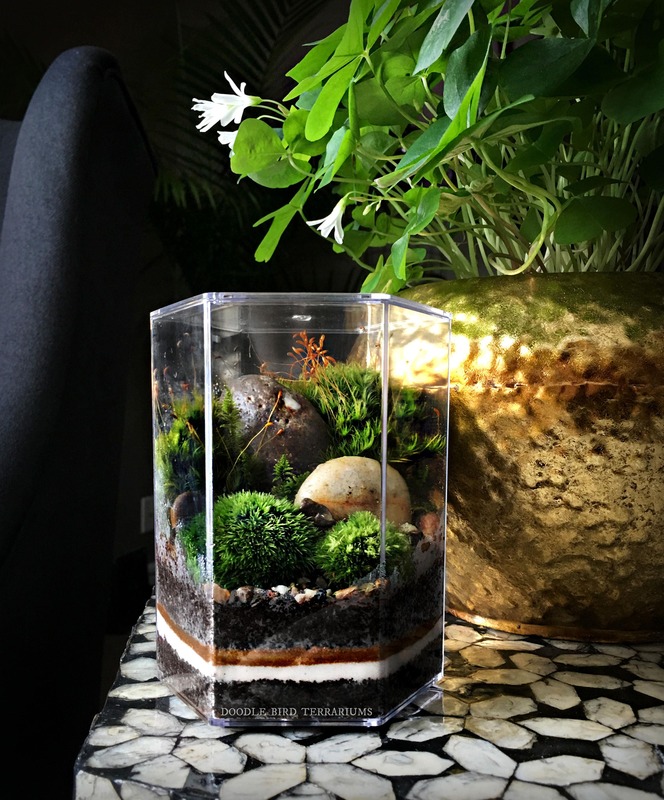 Terrariums are packaged with great care keeping safety in mind. Because of that reason, gift wrapping is not an option. However, a personalized gift card is available upon request and is free of charge. Custom orders are non-refundable and may take longer to process. If a custom order is cancelled there will be a fee to cover the cost of materials. If your package is returned due to an incomplete or undeliverable address you will have the option of a replacement (with additional shipping fees) or a refund in full (minus the shipping fees). I do not work on consignment or wholesale at this time. However a discount may be offered on large quantities ordered upfront. Contact me for details. 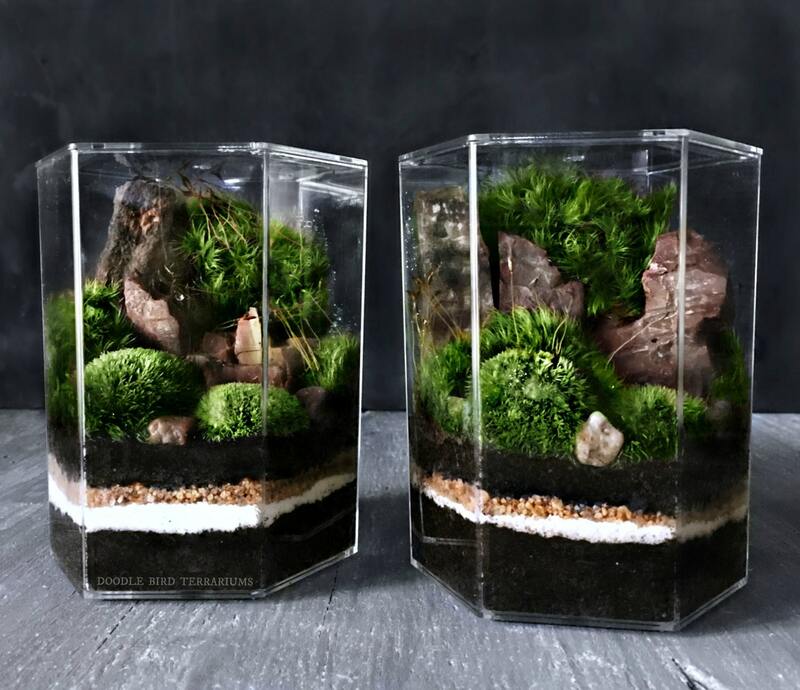 How are terrariums packaged and shipped? Terrariums are packaged with great care. Packing material is used both inside and outside the jar so that the contents are not jumbled around during shipping. Any terrarium containing live plants should be unpacked immediately after arrival. Plants cannot survive long periods of time inside the box or with packing material covering them. If you need to keep the terrarium in the box then place it in the refrigerator until needed. This will keep the plant fresh (simulating winter conditions) and green. Remember to remove the packing material prior to storage.